A new study using data delivered by Dawn’s scientific instruments identified the composition of the bright area within Occator crater as an accumulation of carbonate minerals – the biggest of its kind ever seen off Planet Earth. Previously, scientists had believed the area was made up of magnesium sulfate, but the new studies revealed a different chemical signature indicative of carbonates cooked up in a wet environment. 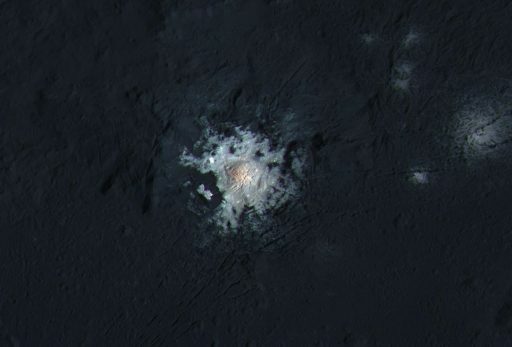 Occator crater, at 80 million years considered young by geologists, is about 92 Kilometers wide and has a 10km wide central pit with a dome structure in the center, covered with the highly reflective material that had been seen in images when Dawn was still on approach to Ceres. With data from Dawn’s infrared spectrometer, scientists were able to single out sodium carbonate as the dominant mineral in the bright material within Occator – a type of salt formed on Earth in hydrothermal environments. 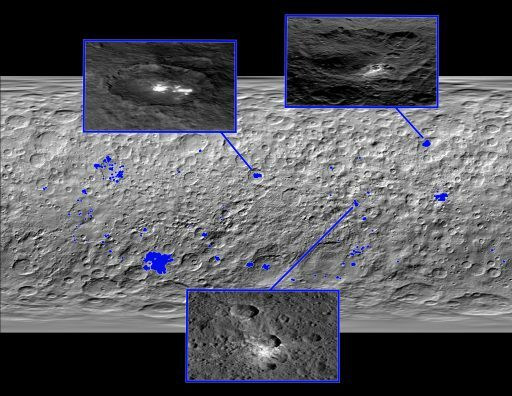 Images delivered by Dawn reveal the material came from within the asteroid, suggesting that temperatures inside Ceres are warmer than previously believed. Because sodium carbonate requires water during its alteration, scientists can now be sure that liquid water existed beneath the surface of Ceres in recent times (on a geological time scale). The salts could represent remnants of an ocean or localized bodies of water that reached the surface. 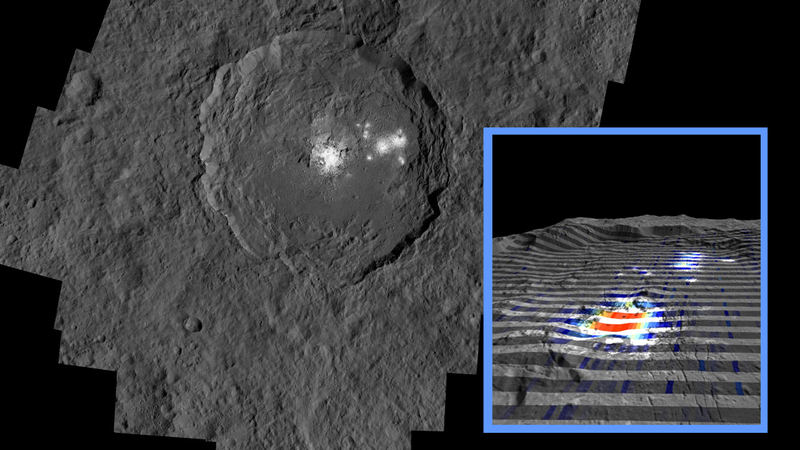 Dawn’s spectrometer also revealed ammonia-bearing salts to be present in Occator – ammoniated clays had already been found elsewhere on Ceres. These findings, together with the carbonate discovery, further support the hypothesis that Ceres formed in the outer solar system around the orbit of Neptune and then migrated inward. Similar ammoniated species and sodium carbonate & bicarbonate have been observed on Enceladus, one of Saturn’s many moons. The newly found minerals also bear relevance in astrobiological considerations and scientists are currently combing through data to find other areas of similar material on Ceres – 130 brighter patches have already been found on Ceres’ mostly dark surface. 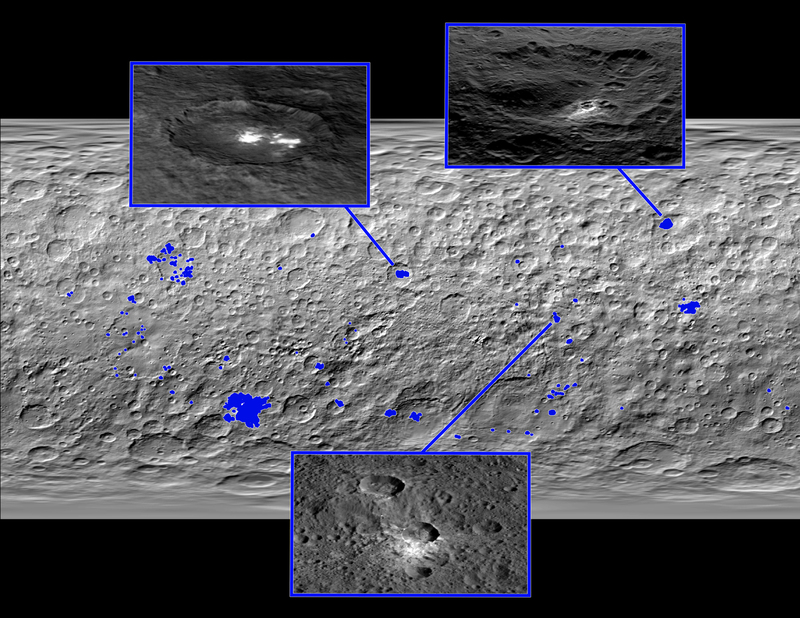 In a separate study published this week, scientists discuss the composition of the outer layer of Ceres that had been expected to be largely made up of ices. However, image analysis disagrees with this initial hypothesis because the largest craters on Ceres, more than 2 Kilometers deep, have not deformed over billions of years, placing an upper limit on the abundance of ice. An icy subsurface would not exhibit that kind of harsh topography seen on Ceres as it reforms over time due to warming and cooling cycles. According to the study, Ceres’ outer layer contains no more than 30-40% ice by volume, the rest being a hard mixture of rock and minerals. Interestingly, while the salts found on Ceres suggest an origin in the outer solar system, a rocky surface has more in common with bodies forming closer to the sun. 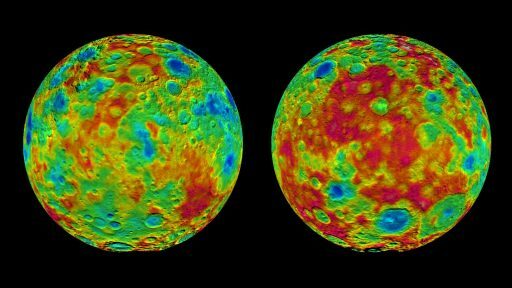 The strange chemistry of Ceres still provides lots of open questions that need answers before a complete picture of Ceres’ past can be painted. It can also be expected that more will be heard about the story of water on Ceres and its role in the dwarf planet’s history. 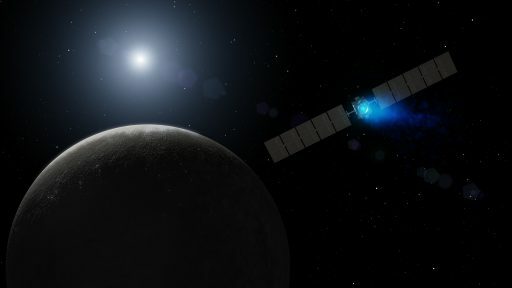 Dawn, having been on a long odyssey through the solar system since its launch in September 2007, was initially looking at completing its mission in mid-2016 when finishing its observation campaign at Ceres. 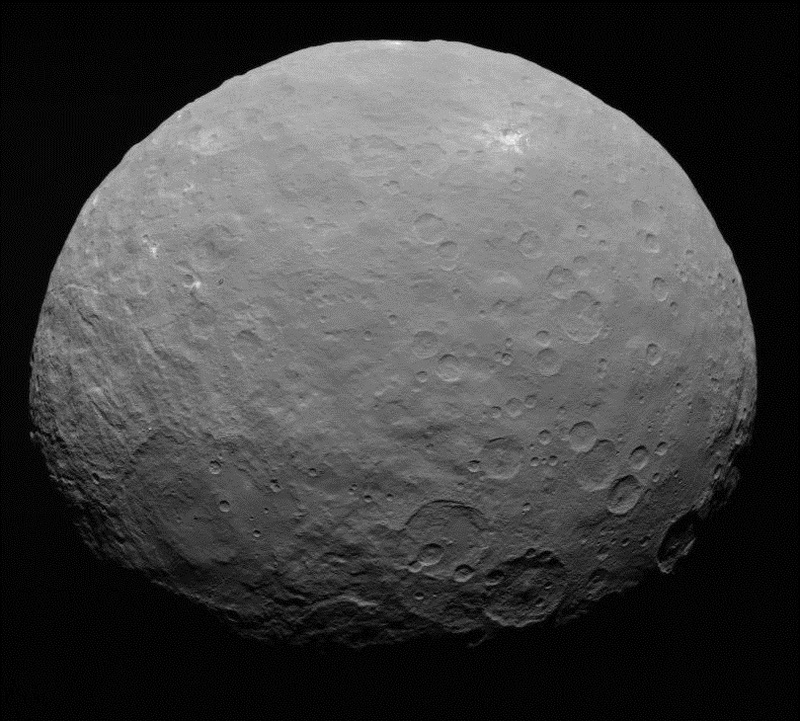 Since December 2015, Dawn has been in a 375-Kilometer Low-Altitude Mapping Orbit where it was planned to remain indefinitely after the completion of the mission, orbiting as a perpetual satellites of Ceres. The Dawn primary mission formally concludes on June 30 as the spacecraft sails into a multi-month mission extension to keep adding to the data set it has been collecting since December. 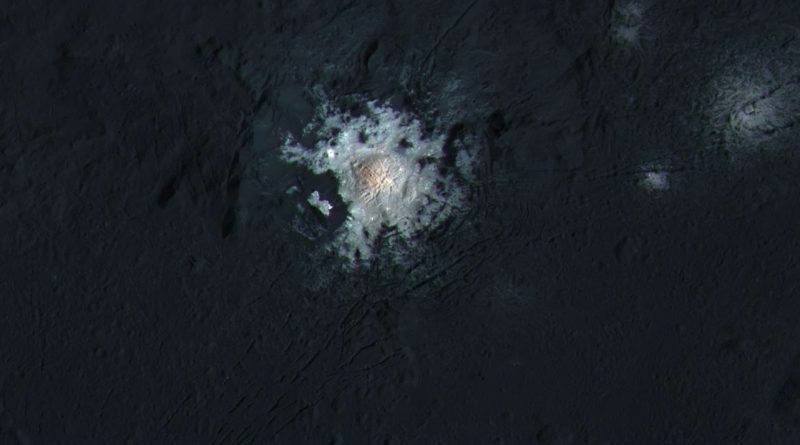 Engineers did not count on such a long mission and a plan was developed to gather the most important science data at Ceres in the first three months of the Low-Altitude Mapping Phase as Dawn showed some degradation in its systems. Two of the probe’s four reaction wheels have failed and Dawn relies on a combination of its Hydrazine-fueled thrusters and the remaining wheels for orientation control. Barring any additional failures, Dawn’s propellant supply may last through early 2017. The mission team has been evaluating different extended mission scenarios including moving Dawn into a higher orbit where Hydrazine consumption is reduced for an even longer extended mission to observe seasonal changes on Ceres.